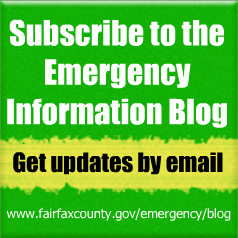 The National Weather Service has issued a Red Flag Warning for Fairfax County and the entire Washington Metro area today, April 3, from noon until 8 p.m.
A Red Flag Warning means that critical fire weather conditions are either occurring now, or will shortly. A combination of strong winds (15 to 25 mph with gusts up to 35 mph), low relative humidity and warm temperatures may promote the rapid spread of outside fires/wildfires. These conditions are ripe for an improperly discarded cigarette, thrown into mulch or other brush, to spark a significant fire that can then spread to homes and buildings. On March 31, Fairfax County Fire and Rescue responded to 13 fires in mulch beds that were more than likely started by improperly discarded smoking materials. So far in 2019, there have been nine significant fires caused by improperly discarded smoking materials! Monetary damages for the nine fires is approximately $914,963! All nine fires were totally preventable. The Fairfax County Fire and Rescue Department wants to help eliminate this totally preventable cause of fire and keep Fairfax County safe. If you smoke, or know someone who does, please take a moment to learn how to prevent starting a fire outside. This story originally appeared on the Fire and Rescue blog. According to the U.S. Fire Administration, December is the peak time of year for home candle fires. Candles start two out of five home decoration structure fires, and the top three days for home candle fires are Christmas, New Year’s Day and Christmas Eve. Be fire smart as you deck the halls for a festive holiday season with these tips. Use battery-operated flameless candles, which can look, smell and feel like real candles. If you do use lit candles, put them in stable holders and place them where they can’t be knocked over. Keep candles at least 12 inches away from anything that burns. Never leave a burning candle alone. Water your Christmas trees every day. A dry tree can easily catch on fire. Keep your Christmas tree at least three feet away from heat sources like fireplaces, radiators, space heaters, candles or heat vents. Don’t let them block your exits. Inspect your holiday lights each year before you put them up. Throw away strands with frayed or pinched wires. Read the manufacturer’s instructions for the number of light strands to connect. Learn more from the U.S. Fire Administration or the Fairfax County Fire and Rescue Department. A good time to remember to check your smoke alarms and carbon monoxide detectors, as well as change the batteries, is when you change your clocks twice a year as Daylight Saving Time begins and ends. Daylight Saving Time ends in the U.S. at 2 a.m. on Sunday, Nov. 4. Fairfax County reminds you to turn your clocks back one hour before you head to bed on Saturday. 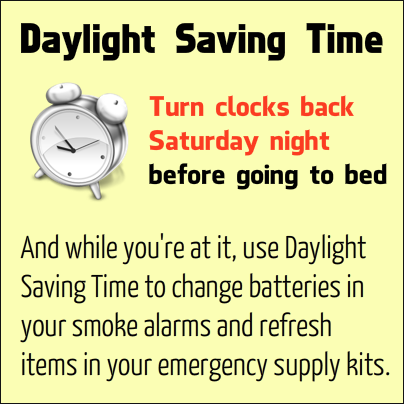 Learn more about Daylight Saving Time from the National Institute of Standards and Technology. According to the National Fire Protection Association, almost two-thirds of home fire deaths resulted from fires in properties without working smoke alarms. A working smoke alarm significantly increases your chances of surviving a deadly home fire. Every home needs working smoke alarms to provide an early warning. Check that you have smoke alarms on every level of your home, including the basement. Be sure to have alarms close to and inside where people are sleeping, especially if you are hosting guests for the upcoming holidays. Never use an oven or stovetop to heat your home in the winter. There also are different types of smoke alarms. Read the Fire and Rescue blog for information on the types of alarms and guidance on when to change the batteries. The time spent changing your clocks and checking your batteries is also an opportunity to refresh the items in your emergency supply kits (at home, in the office and at the car). Items may have expired or been used and not replaced, so be sure to check those kits and make sure you’re prepared for any emergency. ultiple fires in the Centreville area of Fairfax County yesterday, May 2, have displaced over 40 county residents. The county has established an emergency shelter for those affected at Cub Run RECenter, 4630 Stonecroft Blvd, Chantilly. At this time, county human services personnel are working with various nonprofits, including the Red Cross, to provide shelter and assistance. Over the next few days and weeks, those impacted will have various needs, with many having lost everything. However, at this time, county officials are asking residents NOT to drop off any donations until we have a chance to work with our nonprofit partner agencies to determine what those needs are. 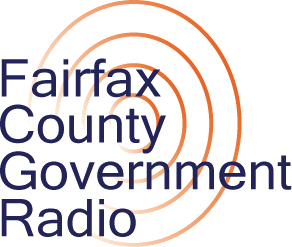 Stay tuned to the blog as well as our social media channels — Facebook and Twitter — for details about how you can assist your fellow Fairfax County residents.